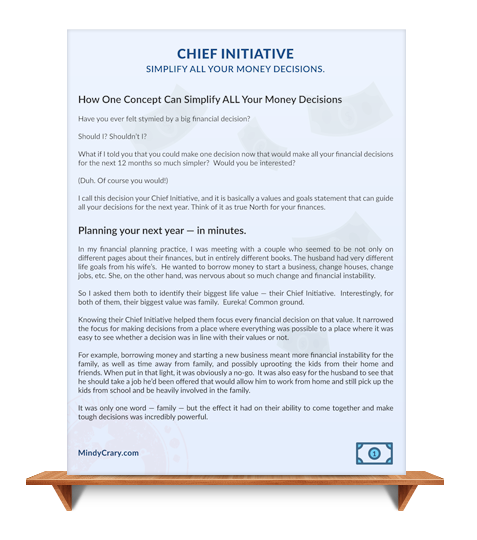 Simplify ALL Your Money Decisions, Download my FREE worksheet to get started! Release your money blocks and finally get excited about making your money plans. One Concept Can Simplify ALL Your Money Decisions. Discover what values should be driving your money decisions. Learn how your values should be reflected in your day-to-day life. Plan the strategies, tactics & behaviors to reflect your values & goals. start making progress towards what you want. The numbers are NEVER what mess people up! So what prevents us from having the best financial life possible? Actually, it’s all in how you think and act—are your values in alignment with how you behave with your money? How do you know? But fear not, because once you understand, you can immediately start to act in alignment and gain traction toward your money goals. Hard to believe, most people don’t even realize they have a choice with how they spend their money…they just think it’s “the way things are.” You’ll be amazed at how looking at your money through the lense of your values changes everything. This Chief Initiative workbook makes it ridiculously simple to finally understand how you have been holding yourself back from earning more and expecting more from your money.